The great news is that the price point for this wine is very good. If I were a U.S. wine distributor, I'd be snapping bottles up. Writer. Journalist. An Exile Returned From Paris. As you all know, my daughter Blair -- the Cheese Princess -- is my eyes and ears in the food and wine world. She leads, and I follow. So when she was here this summer, I had to introduce her to our new friends Sebastian du Petit Thouars and his lovely girlfriend, D'Arcy Flueck -- or @dupetitthouars and @chicsetera in twitter parlance. The Lone Wolf and I had met them a couple of months before, and we were charmed. Sebastian is a Parisian hipster in the best sense of the word, a mod Renaissance man who is up on good music, food, wine, and a range of other subjects including American culture. He has a natural joie de vivre that radiates from him like a cherubic Buddha in a hot, zesty band, and he happens to be running his family's vineyard Chateau du Petit Thouars. Not bad, as our friend M. Malric of the Hotel St. Germain once said to us with a twinkle in his eye. D'Arcy has a background in fashion and luxury goods, and it warmly shows. So naturally we wanted the Cheese Princess to meet these two. 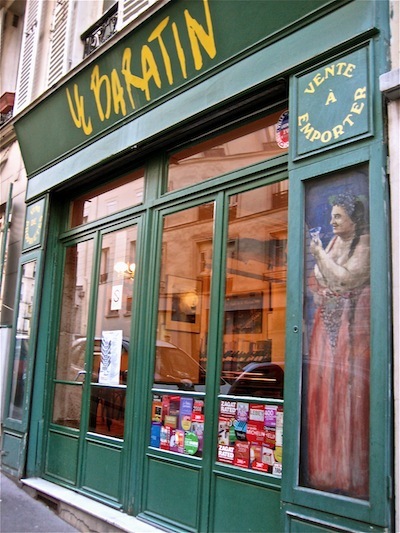 So I snagged a reservation for us all at Le Baratin, a restaurant which we'd wanted to check out for some time in our neighborhood, Paris's 20th Arrondissement. The scoop about Le Baratin is that it's the place where Parisian chefs like to go, including Pierre Hermé. It can be hard to get a reservation, partially because it's difficult to catch someone on the phone. We came. We ate and drank. 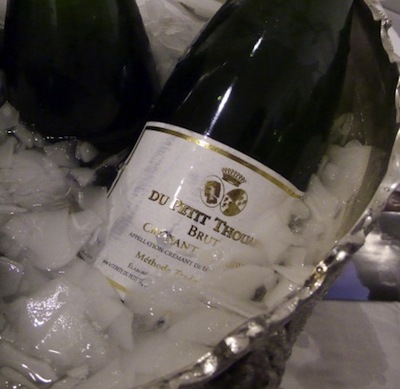 We conquered, starting with a sparkling Vouvray that knocked our socks off. Le Baratin is a haven for both food and wine freaks. The prices are good, and the atmosphere is buzzing with patrons enjoying la bonne vie -- or at least a memorable experience and dinner. Don't come here for romantic quiet. Not the right place. The Lone Wolf and I had tasted some of Chateau du Petit Thouars' delicious cremant and vin rouge in the comfort of our own home, with the added benefit of Sebastian schooling us on them. But at Le Baratin Sebastian and The Cheese Princess had knowledgeable discussions about the wines we happily drank, and he invited us to his parents' apartment later in the week so T.C.P. could degust some of the wines his family produces. Aristide Aubert du Petit Thouars (or Dupetit Thouars as it was spelled during the Revolution) fought in the Independence war of America, sailed the seas seeking La Pérouse and died heroically in Aboukir during Bonaparte's campaign in Egypt ; captain of the Tonnant, he had his right arm shot away, then the left and finally one of his legs was taken off by a cannonball. Refusing to give up command, he insisted on being put in a tub of bran that was on deck and led his men until he collapsed from blood loss. One of his final orders was to nail the Tricolour to the mast so it could not be taken down in surrender. Yves and Marguerite du Petit Thouars (Sebastian's parents), who took over the reins of the Château du Petit Thouars some thirty years ago, took up the challenge to plant new vines and produce wines as delicate and spirited as the Touraine region. 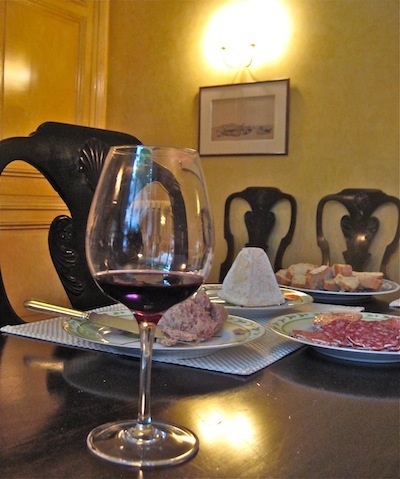 The vineyard is 100% Cabernet Franc, the typical variety of red wines from the Loire valley. Also known under the name "Briton", it produces thin-musked, blue-shaded black berries. Ripe grapes will give wines developing intense red fruit aromas. And so this is how we spent a delightful late afternoon and early evening! Marguerite served some of the most delicious cheeses and possibly the best rillettes I've ever eaten as accompaniments for the wonderful wines we drank. We like to eat well, she told us, and since The Cheese Princess and I are of the same persuasion, we got along swimmingly. The ambiance was also divine as the family has a glorious garden. But I digress. 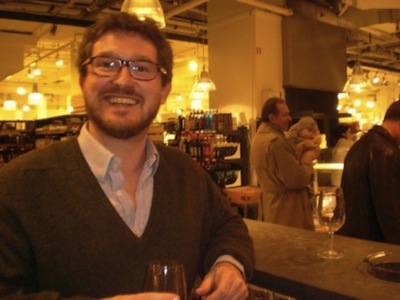 Sebastian took charge of our wine taste-buds, and we were made believers. Okay, I already was, but T.C.P. was impressed, and this increased my feeling. The great news is that the price point for this wine is very good. And so I will tell you that Chateau du Petit Thours can be purchased at the chateau, of course, as well as the fab La Grand Épicerie at Le Bon Marché in Paris. The wine can also be found in Colorado for about $11 a bottle, and more U.S. places coming soon. If I were a U.S. wine distributor, I'd be snapping bottles up. Beth Arnold lives and writes, eats and drinks in Paris. To see more of her work, go to www.betharnold.com. And TheCheesePrincess.com is coming to the Internet near you soon! Stay tuned. A sample here.